Marc Steel is a known manufacturer of ASME SA / ASTM A333 GR.6 Pipes, which has some excellent features to offer such as rugged construction, precise dimensions, corrosion-resistance and more. We are also a leading exporter and supplier of ASTM A333 Carbon Steel Gr. 6 Pipes in our company. We offer an assortment of ASME SA 333CS Gr. 6 Tubes that are widely used in many industries. Buy ASTM A333 Carbon Steel Grade 6 Tubes in reasonable cost from us. Being one of the favored choices of our customers, we are involved in presenting ASME SA 333 Carbon Steel Grade6 Pipes that can be acquired in numerous specifications. 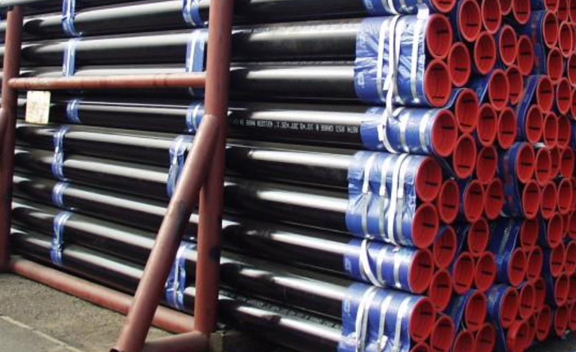 These ASTM A333 CS Grade 6 Pipes are available at pocket friendly price. Meanwhile, these ASME SA 333CS Grade 6 Tubes are precisely designed to work under extreme condition of pressure and temperature. ASME SA 333 Grade 6 Carbon Steel Pipes also offers some other great features such as precise dimension, superior finish, high durability, long service life, lightweight, sturdy design and more. A333 GRADE 6 LINE PIPES, GRADE 6 PIPES, LOW CARBON STEEL TUBE, A333 GRADE 6 SOUR SERVICE LINE PIPES, A333/SA333 PIPES, ASTM A333 GRADE 6 WELDED PIPE MANUFACTURER & SUPPLIERS. CARBON STEEL ASTM A333 GRADE-6 SEAMLESS PIPE, ASME SA / ASTM A333 GR.6 CARBON STEEL PIPES AND TUBING DEALER, ASTM A333 GR.6 LOW TEMPERATURE PIPE MANUFACTURER & EXPORTER IN INDIA. ASTM A333 Grade 6 CS Pipes are made by qualitative range of raw materials and are available in a broad spectrum of sizes and materials at most competitive prices. As these ASME SA 333 Grade6 Carbon Steel Tubes are made available at the most competitive prices, ASTM A333 Grade 6 CS Tubes can be customized in a variety of sizes as per the specifications given by the esteemed patrons. Hong Kong, Iran, United Kingdom, Pakistan, Tibet, Germany, South Korea, Ukraine, Sweden, Bulgaria, Japan, Namibia, Israel, Vietnam, Nigeria, Mongolia, Macau, Poland, Azerbaijan, Venezuela, Denmark, Yemen, Gambia, Gabon, Kazakhstan, Lebanon, Greece, Morocco, Mexico, Afghanistan, Italy, Singapore, Kuwait, Slovakia, Belarus, Trinidad & Tobago,Tunisia, Thailand, Chile, Saudi Arabia, Norway, Bangladesh, Costa Rica, India, Croatia, Brazil, Sri Lanka, Colombia, Finland, Canada, Nigeria, Kenya, Belgium, New Zealand, Poland, Peru, Argentina, Indonesia, South Africa, Libya, Estonia, Philippines, Chile, Malaysia, Switzerland, China, Turkey, Iraq, Oman, Austria, Taiwan, Portugal, Mexico, Puerto Rico, Ghana, United States, Lithuania, Qatar, Netherlands, France, Jordan, Ireland, Zimbabwe, Bhutan, Angola, Nepal, Egypt, Russia, Ecuador, Czech Republic, Australia, Serbia, Hungary, Iran, Bahrain, Algeria, Spain, Bolivia, United Arab Emirates, Romania. Perth, Ulsan, Jamshedpur, Haryana, Ankara, Petaling Jaya, Pune, Al Jubail, Coimbatore, Riyadh, Hanoi, Navi Mumbai, Bangkok, Bengaluru, Sydney, Kuwait City, Chennai, New York, Montreal, Cairo, Aberdeen, Algiers, Dallas, Pimpri-Chinchwad, Kuala Lumpur, Gurgaon, Faridabad, Edmonton, Hyderabad, Kanpur, Nashik, Noida, Tehran, Busan, Port-of-Spain, Sharjah, Bhopal, Ho Chi Minh City, La Victoria, Chandigarh, Calgary, Hong Kong, Melbourne, Rio de Janeiro, Bogota, Mumbai, New Delhi, Los Angeles, Howrah, Geoje-si, Ludhiana, Baroda, Dubai, Kolkata, Ahmedabad, Abu Dhabi, Istanbul, Courbevoie, Nagpur, Caracas, Jeddah, Thiruvananthapuram, Ernakulam, Karachi, Seoul, Granada, Toronto, Jaipur, Indore, Ahvaz, Vung Tau, London, Ranchi, Lagos, Milan, Chiyoda, Mexico City, Gimhae-si, Brisbane, Manama, Thane, Vadodara, Surat, Visakhapatnam, Rajkot, Lahore, Atyrau, Dammam, Houston, Colombo, Madrid, Moscow, Jakarta, Santiago, Singapore, Al Khobar, Muscat, Secunderabad, Doha.